Benaroya Publishing is proud to announce that Red Spike, Samurai’s Blood and Marksmen are available as digital comics though Comixology, both on their website and through the Image Comics’ digital app. Whether you’re an avid digital comics reader or a fan unable to find copies at their local comic store, you can easily have Red Spike, Samurai’s Blood and Marksmen available on your home computer or portable iDevice. 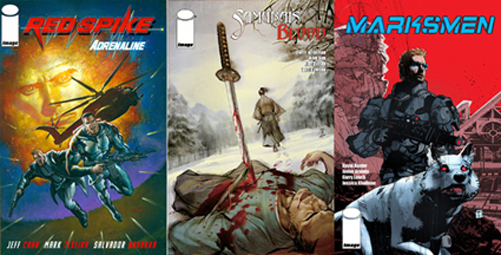 Each comic costs $1.99 and you can download a FREE preview of Red Spike #1 and Samurai’s Blood #1. This entry was posted on Tuesday, September 27th, 2011 at 10:50 am	and is filed under Marksmen, Red Spike, Samurai's Blood. You can follow any responses to this entry through the RSS 2.0 feed. Both comments and pings are currently closed.